Pope Benedict XVI celebrated Mass on the steps of Rome’s Cathedral Basilica of St John Lateran Thursday evening, and then led the faithful in Eucharistic adoration before a public procession through the streets of Rome to the Basilica of St Mary Major, to mark the Solemn Feast of the Most Precious Body and Blood of Our Lord, Jesus Christ – the Feast of Corpus Domini or Corpus Christi. 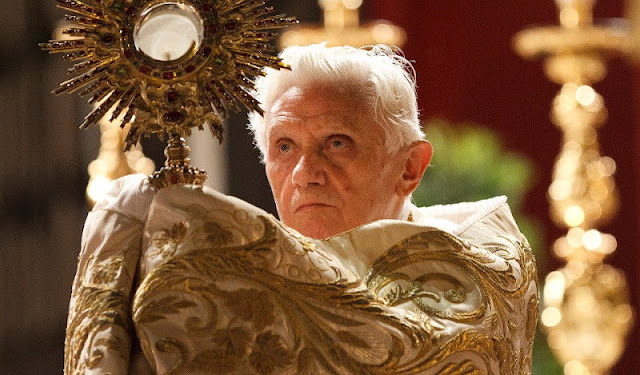 If, for example, this city's Corpus Domini procession was abolished in the name of a secularized faith no longer in need of sacred signs, the spiritual profile of Rome would be "flattened", and our personal and community consciousness it would be weakened. Or think of a mother and a father who, in the name of a desacralized faith, deprived their children of all religious rituals: in reality they would end up leaving the field open to many surrogates in the consumer society, with other rites and other signs that could more easily become idols. God our Father, has not done so with humanity: he sent His Son into the world, not to abolish the sacred, but to complete even this.